Emulating the Nintendo DS on your PC is extremely simple--alarmingly so for hardware that's still very commercially successful. All you need to do is grab the oddly named DeSmuME and get going with the default settings. Just download the package, unzip it, run the .exe, and then open the File menu and choose Open ROM. Nintendo DS screen at slightly reduced size. Compatibility is near 100 percent, and few machines will have any trouble running it at full speed. If you find that you need a boost, try switching to the OpenGL renderer in the 3D settings config menu, as it's about twice as fast and only slightly less compatible. 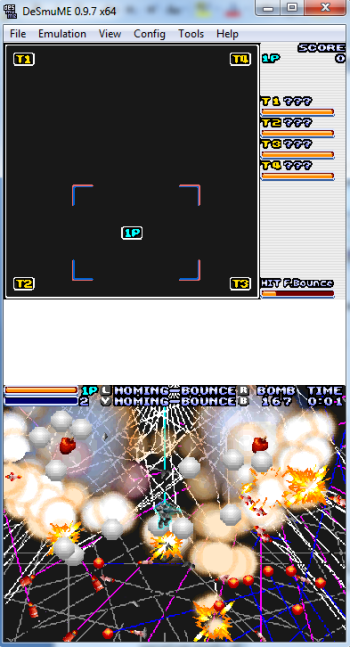 You may find that some games look a bit more natural if you change the screen separation in the View menu to approximately the half-inch of dead space on a real DS (pictured at right); but that's about as far as you'll have to go. Using a mouse in lieu of the DS's stylus works about as well as you'd expect (some people--like me--prefer it). It's surprisingly difficult to translate quick motions in games like Trauma Center due to the relatively large size of the PC screen, but many others work just fine.